CPL fosterers do amazing work which enables us to help cats and kittens even when they haven’t had the best start in life. 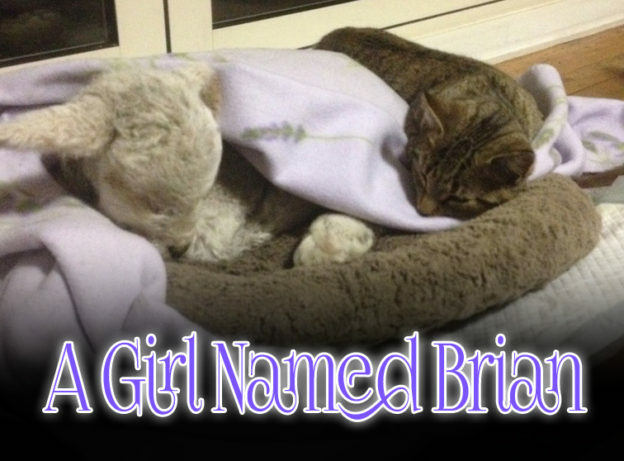 This is the story of a little kitten named Brian, and the fosterer who made room in her heart and home. Brian and her sister were wild when they arrived. They were not able to be handled and quite a challenge. Both were thought to be boys. I have a small sleep-out where they were kept for 2 months as couldn’t cope with being inside the house. I spent a lot of time out there and eventually tamed Brian’s sister, Barry, enough to be de-sexed (when we discovered he was a she) and homed (as Betty). Brian was a harder nut to crack and there just didn’t seem to be much of a future ahead of him. After discussing it with Robin, the decision was made to euthanize. I learned it’s one thing to talk about it and another to actually go through with it. I couldn’t do it. So I persevered and about a month later there was definitely progress. I could touch Brian when he was eating and he no longer hid when I entered the room. We ended up going through with de-sexing, where we learned Brian was also a girl, and put her up for adoption. I believe someone did come to view her but a week and a half later she was still in the cattery. We knew she was not going to be easy to home and the thought of her possibly growing up in a cage was awful. So…I adopted her. Since then she’s just exceeded all expectations. She’s now in the house with the other cats and 2 dogs. I accept I will never be able to give her cuddles but she’s happy and safe. Two weeks ago whilst walking my dogs at the park, we found a dying lamb. I took it home and put it on a heat pad which revived it somewhat. When I got up for feeding overnight, I found Brian curled around the lamb. It was pretty amazing. She stayed right through the night. I have now adopted 3 of my fosters and have no regrets.. I love Brian!